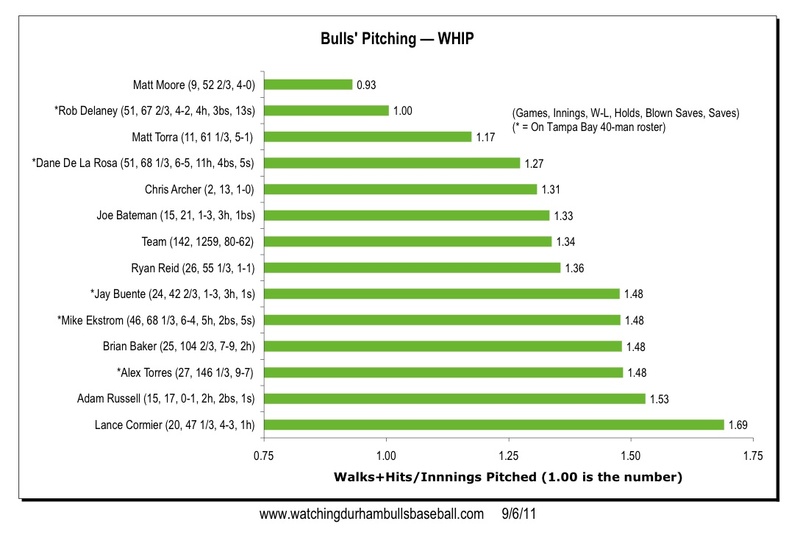 Before the playoffs start I wanted to wrap up the season’s charts by taking a look at the pitching stats. Click on a chart for a larger view. 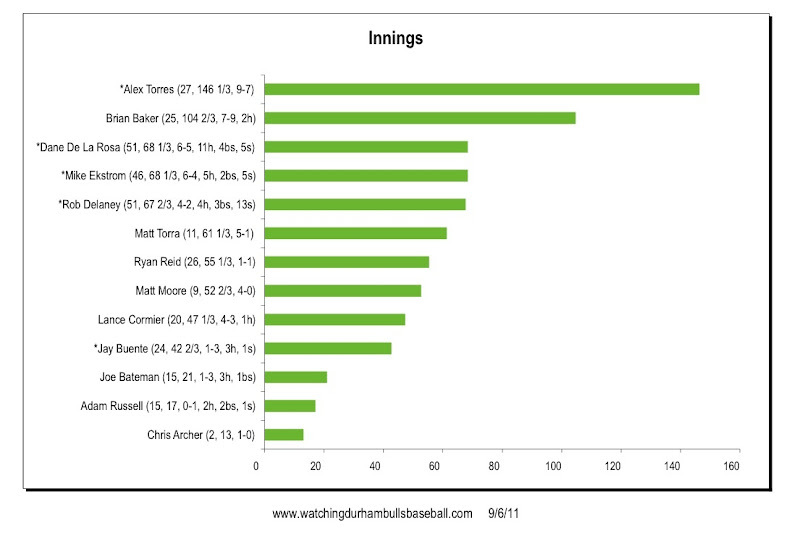 Just to set the stage, I want to look first at the innings pitched by the pitchers who made it to the end of the season. Note that I’ve left Ryan Reid on the roster even though he’s officially on the DL. 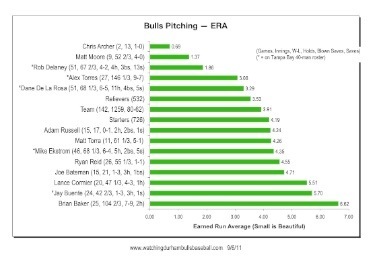 I’ve also left on these charts the two pitchers temporarily dropped for the beginning of the playoffs, Lance Cormier and Brian Baker. What's striking about this chart is the story it says about AAA baseball. The turmoil among the starters has been such that only one left standing (Alex Torres at 146 ) has a significant amount of innings and that is far below the number of innings pitched by four of the five Tampa Bay starters. Only one, Jeff Neimann, has pitched fewer innings (121), and he was on the DL for quite a while. James Shields of the Rays has 218 innings so far. The core of the Bulls relief core (De La Rosa, Ekstrom, and Delaney), on the other hand, have quite a few more innings than their major league counterparts. The Ray's Peralta leads the Rays with 60 innings in 57 games. 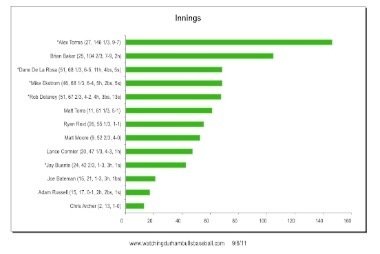 A last reason for leading with this innings chart is to warn readers of the small sample size problem with several of these pitchers. 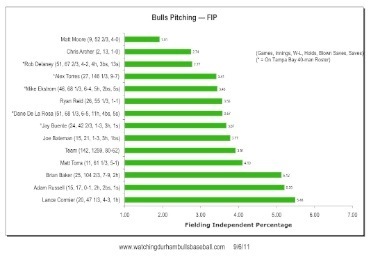 Sorting out the ERA and FIP (Fielding Independent Percentages) of this crew shows some differences. If FIP is supposed to be a more reliable predictor of the future, then sending Cormier and Baker to Montgomery makes some sense. And we need to cross our fingers if Adam Russell comes to the mound in relief. 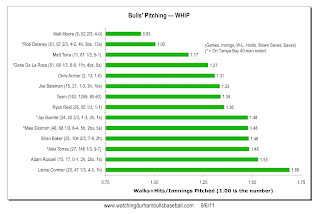 Next are the Walks and Hits per Innings Pitched, WHIP. 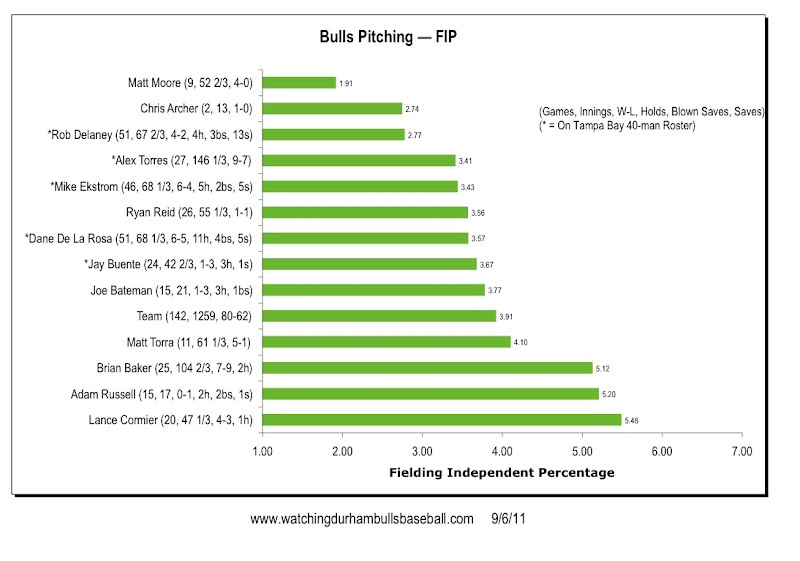 No surprise to see Alex Torres down near the bottom. 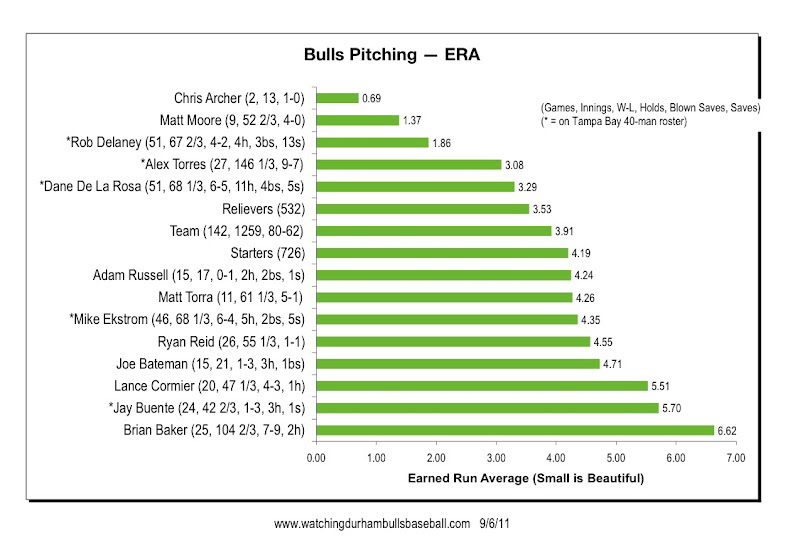 Even with the small sample size, it's encouraging to see Moore, Torra, and Archer near the top. 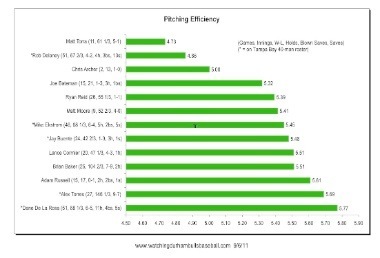 Lastly we have WDBB's very own "efficiency" stat. 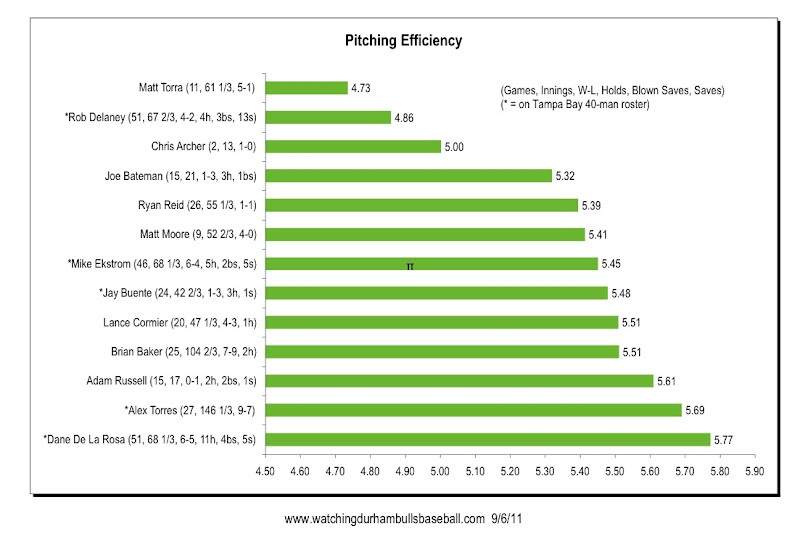 This is a simple measure of pitches thrown per out recorded. What might it mean? Well, it means that two guys who have been reasonably successful, Dane De La Rosa and Alex Torres have to work really hard to get through an inning. Matt Torra not so much.